We just launched a YouTube channel to share our videos. Click here for the link to the Graves Light Station YouTube Channel. The first feature is the above magnificent 34-second time-lapse montage. Using a remote camera, we snapped a photo every five minutes for four days, resulting in this video. Take a look at how the tide rises and falls, the sun and moon rise over the horizon, the workers move up and down the lighthouse and around the dock and ledge, and the light itself casts its beacon over the dark sky. We also link to YouTube videos that other people shot, where Graves Light is seen or referenced, and arranged them on playlists for “one-stop shopping” for Graves Light videos. We’ll continue to expand these lists. The Graves Light keepers describe how the crew created the remote camera system: “We used a Canon 5D camera with a 24mm lens. My nephew Patrick and I built a waterproof housing out of a 50 caliber ammo box and powered it with two solar panels and a car battery. “The real trick was the triggering device: Patrick cracked an old cell phone which he can fully control from his iPhone. 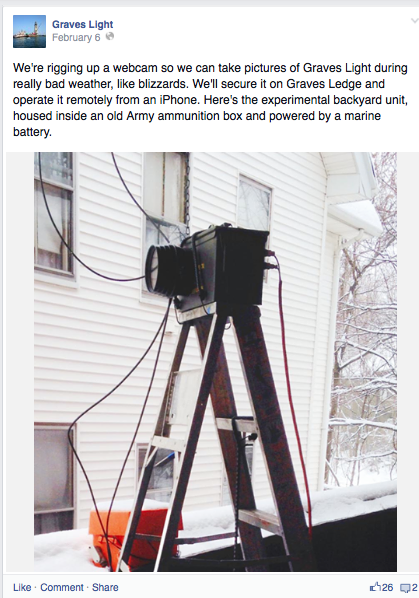 See the photo of the initial improvisation with the ammunition box, which we posted on Facebook in February. Again, here’s the link to our YouTube channel. Tagged restoration, video, YouTube channel.